UP elections polling ends, voter turnout at 55% by 4pm. New Delhi: Voting for the fourth phase of assembly elections in Uttar Pradesh for 53 assembly constituencies is underway on Thursday. The constituencies are spread over 12 districts, including the backward Bundelkhand region and the Nehru-Gandhi pocket borough of Rae Bareli. There are 680 candidates in the fray, whose fate will be decided by 1. 84 voters, including 84 lakh women. ■ 5.30pm: Polling ends for the 4th phase of assembly elections in Uttar Pradesh. ■ 5.15pm: Mayawati: “The whole country knows that there is no bigger Kasab or terrorist than Amit Shah,” the BSP supremo said at a rally in Ambedkar Nagar. ■ 4.00pm: 55% polling till 4pm. ■ 3.30pm: 50% voting till 3pm. ■ 2.45pm: PM Narendra Modi addresses election rally in Bahraich, replies to Akhilesh Yadav’s Donkey jibe. Donkey is very hardworking and loyal to his owner. For 100 crore Indians I don’t mind working like a donkey. A donkey works even if hungry or tired. ■ 2.00pm: BSP’s Naseemuddin Siddiqui, says we will sit in Opposition in case we don’t get majority, CNN-News18 reported. ■ 1.30pm: The voter turnout has been recorded at 39% by 1pm. 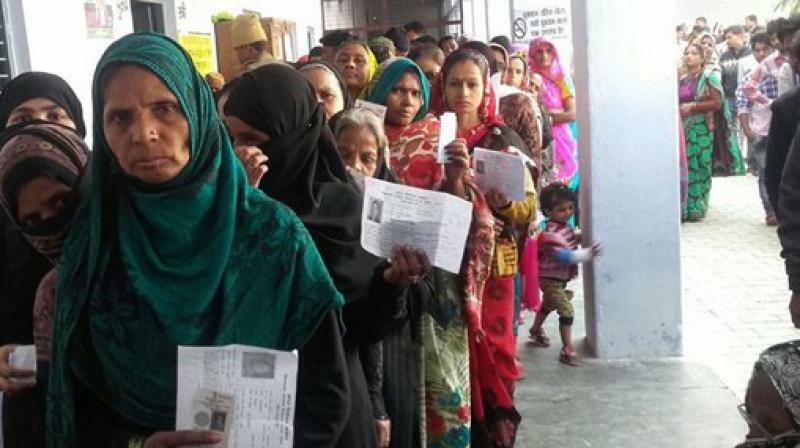 ■ 12.00am: An estimated 25 to 27% of 1.84 crore voters exercised their franchise till midday on Thursday in the fourth phase of polling in Uttar Pradesh, reports PTI. Prominent candidates include sitting MLA from Rampur Khas (Pratapgarh) Aradhana Mishra who is the daughter of Congress MP Pramod Tiwari, and Independent MLA and minister Raghuraj Pratap Singh alias Raja Bhaiya, who is again contesting from his traditional Kunda (Pratapgarh) seat. Also read | Will UP politicians with criminal records allure voters? In Rae Bareli, Aditi Singh is contesting on a Congress ticket, BSP turncoat Swami Prasad Maurya’s son Utkarsh Maurya is in fray from Unchahar seat, while Leader of Opposition Gaya Charan Dinkar is contesting from Naraini (Banda) seat. Senior SP leader Reoti Raman Singh’s son Ujjwal Raman Singh is in the race from Karchana (Allahabad) seat. Other districts where polling is going on in this phase amid tight security are Pratapgarh, Kaushambi, Allahabad, Jalaun, Jhansi, Lalitpur, Mahoba, Banda, Hamirpur, Chitrakoot and Fatehpur. The maximum number of candidates (26) are in Allahabad North, while only six candidates are in fray in Khaga (Fatehpur), Manjhanpur (Kaushambi) and Kunda (Pratapgarh). BSP has fielded its nominees in all seats, while BJP’s nominees are in 48 constituencies. BJP has left 6 seats for its ally Apna Dal. SP nominees are in contest in 30 segments and its ally Congress is in contest from 25 constituencies. ■ 11.15am: 23.78% voting in Uttar Pradesh till 11am. Banda-21%, Raebareli-25.2%, Jalaun-22.9%, Allahabad-24.24%. ■ 10.00am: TV reports suggest slow turnout till 10am. ■ 9.00am: The campaign ahead of the 4th phase of voting saw controversial statements and remarks from all leaders. While the Prime Minister Narendra Modi targeted the Samajwadi Party-Congress alliance and the BSP, accusing them of corruption. “SCAM stands for SP, Congress, Mr Akhilesh and Ms Mayawati,” the Prime Minister told the voters in Bundelkhand. He had also coined an acronym for Mayawati’s BSP—the “Behenji Sampatti Party”. Mayawati retaliated with calling the PM as “Mr Negative Dalit Man”. UP chief minister Akhilesh Yadav referred to an advertisement of the Gujarat tourism department and advised Bollywood actor Amitabh Bachchan not to “advertise for the donkeys of Gujarat”. ■ 8:40am: Voting has still not started in booth no 481 in Jalaun as the EVM machine is not working, TV reports. ■ 8.00am: In 2012, the Samajwadi Party had won 24, BJP five, Bahujan Samaj Party 15, Congress six and ‘others’ three of these 53 seats.